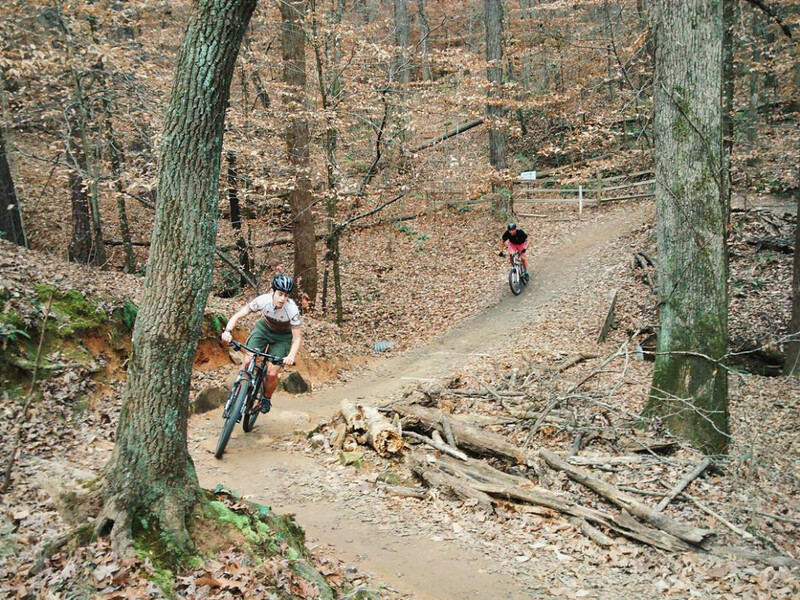 Sope Creek has a network of single track trails that are great to build fitness and skills for any rider wishing to get better at technical sections and climbs. Trails are muddy and closed to mountain bikers during rain or just after. $3 (cash) parking fee for Chattahoochee National Recreation Area. Sope Creek is the closest single-track network to the urban core of Atlanta. Being just 15 minutes from Downtown makes it one of the most popular and well known. Maintained by the volunteer group SORBA Atlanta, the Sope Creek trails are on land administered by the National Park Service. Once you climb up into the woods, there is a great dense tree canopy hiding some fun and flowing singletrack. If you start from the multi-use path along the Chattahoochee it also means you will start the trail network predominantly gaining elevation up to the two-way connector trail between Upper and Lower loops no matter which direction you travel. Counter-clockwise is two sustained climbs punctuated by a short descent, and a few steeper rollers pitching down and back up sharply. The Lower loop traveling counter-clockwise has a more challenging descent that is much more rocky than any other part of the network and requires more concentration and good line selection. Clockwise features a flowing open descent, that, much like climbing the opposite way features many short sharp rollers as you gradually lose elevation. Parking at Column or Interstate North allows you to finish the loops with a descent. However if you park at the Paper Mill Road trailhead you will finish the ride with a climb. On busy days however the Paper Mill trailhead can be easier to access than the other two. At the two-way connector trail you can choose to head north to ride around the Upper loop. The connector trail features a very fun descent with a series of switchbacks in the middle to make things fun. But what goes down, must come up. Both clockwise and counter-clockwise routes feature some sustained climbing up to Sibley Pond and then one last climb up to the Paper Mill parking area. Riding counter-clockwise on the Upper loop especially in cooler months provides some great views of Sope Creek itself in the ravine below. This side of the trail has some obstacles which require attention, even while climbing, but you might miss views of the rapids below if you roll through here too fast. In general the trails range from Beginner to Intermediate in technical skills but require an Intermediate level of fitness to not feel like the hills are crushing you. However, it’s a great trail to build fitness and skills for any rider wishing to get better at both as the technical sections are learnable and the climbs are always a challenge. There are three ways to access the Sope Creek trails. One is the Columns Drive parking lot, the next is the lot off of Paper Mill Road, and the third is the Interstate North lot. Starting from the either the Columns or Interstate North parking areas, you will ride a flat crushed gravel multi-use trail to get to the singletrack. This crushed gravel path creates a 5k loop that is great for a slow speed warm up or cool down. 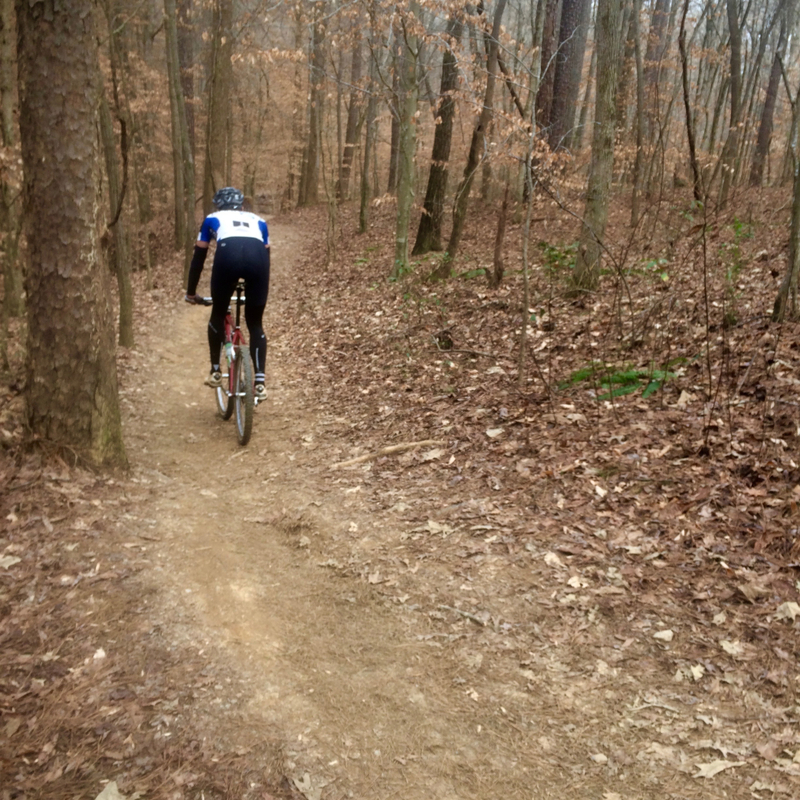 You can ride the gravel loop to the singletrack trailhead. The singletrack network itself changes travel direction depending on the day of the week, so pay attention to the signs to know which way to proceed.